Known as the City of Light, Paris, France is a dream destination for many travelers. 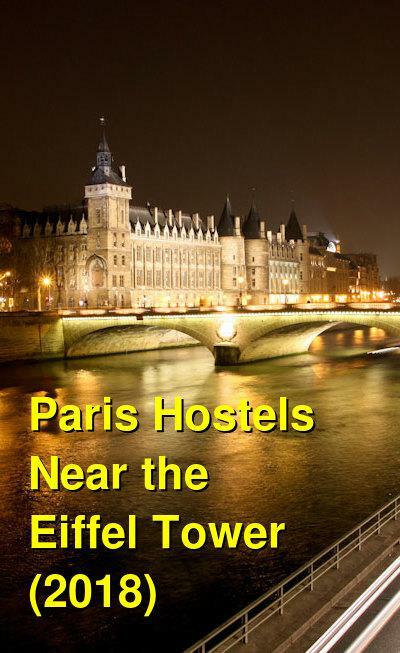 There are a handful of hostels and hotels near the city's most famous landmark, the Eiffel Tower. Because Paris is so large, you will likely us public transportation to travel between neighborhoods, so it's best to get familiar with the metro system early in your visit. You'll find you can cover more ground and see more sights if you plan ahead and take advantage of public transportation. This hostel is centrally located just a short walk from the Eiffel Tower. It's also very close to the Arc de Triomphe, the Champs Elysees, the Mesee Rodin and much more. Public transportation is not far away so you can easily access all of the interesting neighborhoods around Paris. The rooms have been recently renovated and they are charming and pleasant with traditional Parisian decorations. Other amenities available to guests include free breakfast, free internet service, free city tours, movie nights, a luggage room, and much more. There is also a kitchen available for guests use. If you're hoping to take the metro, the closest station is Volontaire. From there you can access many parts of the city. You'll be able to reach some of the city's best restaurants, bars, and clubs with very minimal effort. This hotel is located right in the middle of the business and commercial districts of Beau Grenelle. 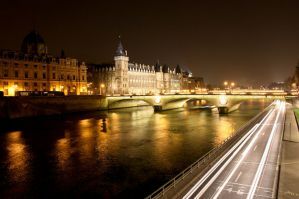 It's near cinemas, restaurants, and shopping areas and it's right between the Gate of Versailles and the Eiffel Tower. You can reach the Eiffel Tower in about a fifteen minute walk. It's also just a ten minute walk from the Seine River. The staff at this hotel is very helpful and informative. They speak a variety of languages including French, English, Arabic, and Russian. There's a family atmosphere with a variety of perks for guests. The hotel has been recently renovated and has 35 rooms that have bathrooms, showers, television, and telephones. Public transportation is not far away either. You can easily access the metro or buses. This hostel is conveniently located near Montparnasse in the Brancion neighborhood, and is a quick trip to the Eiffel Tower and the Porte de Versailles exhibition center. It's perfect for budget travelers, business travelers looking for a cheaper option, and families. Various private rooms and dorms are available, all of which have been well furnished and they have a wonderful atmosphere. It's the perfect place to relax after a long day exploring the city. Amenities for guests include ensuite bathrooms, free internet and WiFi, hot showers, free breakfast and more. There are many rooms available that will meet any traveler's needs for a range of costs. This hotel offers the perfect combination of charm, comfort, affordability, and location. It's situated between the Eiffel Tower, the Tour Montparnasse, and Invalides. There is a cosy atmosphere with a social lounge and bar. The rooms are decorated in a welcoming way and they offer the perfect base for exploring Paris. Whether you're in town for business or pleasure, this location offers you access to everything. The rooms include cable television, private bathrooms, phones, and a decor that reflects the "Provence style".